Opening Times: Club times (non exclusive) Tue (summer only) 1900-2045, Thu (all year) 1900-2045. No public times. Imberhorne School were awarded a Lottery grant to build an Athletics Training Facility (ATF) at the school. The work started in Sep 2000 and was completed on 11th Sep 2001 when the line markings were completed by Athletic Markings Ltd. The host club started using it for training on 11th October 2001. 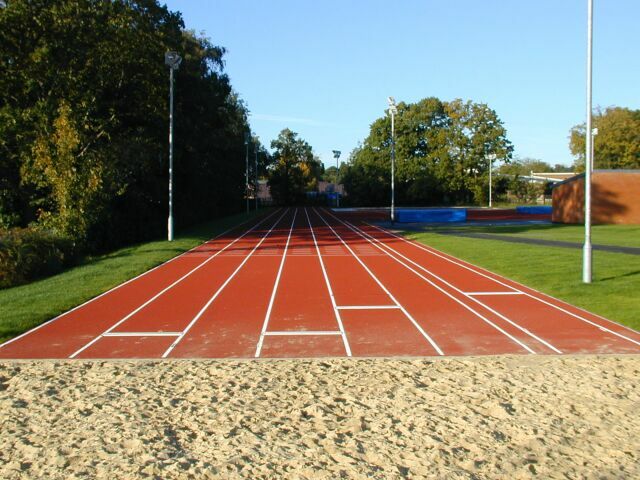 The ATF was built by McArdles with the track surfacing done by Fox Sports Surfaces. It consists of a 6 lane 130m synthetic straight with full facilities for field events. A 400m grass track has been built by levelling an area behind the ATF but although the work was completed in 2002 it will not be available until 2003. It will be drained in an attempt to keep it operational under most circumstances although it is not known whether it will be available all-year round. The facilityis floodlit except for the long throws and and the grass track. Prior to the building of the ATF, East Grinstead AC used a track at Sackville School, Lewes Road, EAST GRINSTEAD, RH19 3TY that is only marked out in the summer on a redgra arena.